A fully geared target shooter, hunter, mountain trekker, or military in combat is well-protected from head to toe, especially with the best and toughest boots. The best jungle boots are your first line of defense against the elements that could slow down or gravely affect your performance in the outdoors. Jungle boots are not just tough on the outside but also offers the most trusted feet cushion and protection from the inside. Shopping for a jungle boot upgrade is not a walk in the park that’s why we help you make a lucrative and sound buying decision. 2.0.2 Our 2nd Choice for Toughness/Durability: 880 Elk Tracker Big Game Hunting Boot (Irish Setter). The holy grail of jungle boots should be tough, heavy-duty, and with proven and tested durability to last for years. You wouldn’t want your boots giving up on you in the middle of nowhere with the harshest of weather condition, would you? Industry-grade jungle boots are made from tough and premium quality materials for longer lasting use, no matter how frequently you use them in the most impossible of terrains and environments. Pro Hunting Men’s Arctic Boot (Muck Boot). The pull-on hunting boot for men is made from imported synthetic and fabric materials with synthetic sole and the excellently molded outsole. Adding to the heavy-duty design of the arctic boot are the double reinforcements at the heel, Achilles, and instep for the ultimate protection. 880 Elk Tracker Big Game Hunting Boot (Irish Setter). Unlike the Pro Hunting Men’s Arctic Boot model, this boot is made from leather materials with rubber sole along with the removable EVA comfort cork footbed made from high-quality memory foam. Your feet are protected and cushioned from the elements through the waterproof GORE-TEX fabric lining while the ScentBan technology keeps your feet free from odor-causing bacteria. 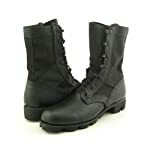 It is heavy-duty and tough footwear that could last for several days, even decades, with the right maintenance and care. 860 Elk Tracker Waterproof Gram Boot (Irish Setter). The US-made boots have the same leather construction as that of its 880 Elk Tracker Big Game Hunting Boot counterpart from the same manufacturer and Elk Tracker boot series. It has the same synthetic sole as the Pro Hunting Men’s Arctic Boot model but the Bulls-Eye Air Bob Aggressive traction technology is something that makes it unique and different from the other two models. Our 2nd Choice for Toughness/Durability: 880 Elk Tracker Big Game Hunting Boot (Irish Setter). Wouldn’t it be great if you have the most affordable jungle boots with high-quality features that could last for years? Idealistic as it may sound, only quality and affordability in a pair of jungle boot makes a remarkable and lucrative investment. Is it possible to find one? You can closely look into our top 3 selections and see which of these industry-grade hunting and outdoor boots offer the best value for your money. 860 Elk Tracker Waterproof Gram Boot (Irish Setter). The model is on top of the price scale in our selection. You may need to shell out extra cash for this pair but the quality and toughness of the footwear is worth every dollar you spend. The relatively more expensive pair of boots is jam-packed with the most advanced features including the waterproof GORE-TEX lining, the lace-up premium aesthetics, and the innovative soles for better traction. 880 Elk Tracker Big Game Hunting Boot (Irish Setter). Our mid-range jungle boot model from the same Irish Setter manufacturer is reasonably priced with some of the best features including the same GORE-TEX fabric lining insulation feature just like the 860 Elk Tracker Waterproof Gram Boot model. However, you just might have a more inferior pair because it doesn’t have the innovative sole design for traction and superior protection. Pro Hunting Men’s Arctic Boot (Muck Boot). The most affordable model in our price scale is from Muck Boot, recognized footwear that has been the official wear for research stations in Prudhoe Bay, Alaska. Though it comes with a low-cost price unlike the more significantly expensive 860 Elk Tracker Waterproof Gram Boot model, this arctic boot is never inferior in quality and performance. It comes with a 2mm thermal foam underlay for superior insulation, something that the880 Elk Tracker Big Game Hunting Boot model doesn’t have. Jungle or hunting boots should be tough on the outside but downright comfortable to your feet. The footwear must also not give you a hard time using or putting it on especially in cases when you needed to gear up right away. Our top selection offers the best comfort and ease of use through their innovative designs. Pro Hunting Men’s Arctic Boot (Muck Boot). One of the unique features of this pair is its pull-on design with stretch-fit top line and the waterproof upper and shaft. The thick 2mm thermal foam underlay makes it comfortable and keeps your feet insulated all the time. 860 Elk Tracker Waterproof Gram Boot (Irish Setter). Unlike the Pro Hunting Men’s Arctic Boot model, this leather pair features a lace-up design which would potentially consume more minutes when gearing up for the occasion. It, however, features the advanced aggressive sole for traction and the waterproof GORE-TEX lining. 880 Elk Tracker Big Game Hunting Boot (Irish Setter). The lace-up leather boots have the same design as its 860 Elk Tracker Waterproof Gram Boot counterpart but its patented Thinsulate insulation is something that the Pro Hunting Men’s Arctic Boot model lacks. The best jungle boots provide remarkable protection and comfort, cushioning your feet from the harsh outdoor conditions including rain, snow, and mud. However, it must also have the durability and toughness as well as the affordability that would make a lucrative and wise investment. You can find the best outdoor or hunting boots in our selection but each has their own strengths and weaknesses. Based on the reviews and criteria, what exactly is the best jungle boots on the market today? We recommended the Pro Hunting Men’s Arctic Boot (Muck Boot) model for its high scores in various segments particularly Comfort, Ease of Use, and Value for Money. This pair is a tough cookie with easy to wear pull-on design and the thick insulation interiors.